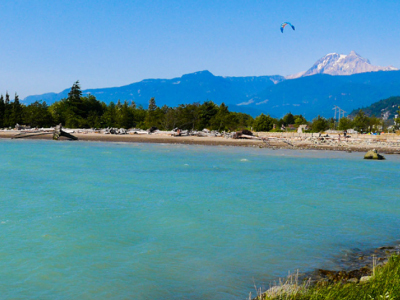 #ExploreSquamish Family Getaways – 45 Minute Drive From Vancouver! Looking for a family weekend getaway close to Vancouver to enjoy nature and explore together? Load up the car & hit the road! Just a 45-minute drive up the scenic Sea to Sky Highway you will find the family friendly gem of Squamish. Nestled in the gorgeous Howe Sound surrounded by towering peaks and the magestic Stawamus Chief, the friendly town has so many amazing offerings for adventurous families. Squamish is one of our favourite places to explore and we are happy to share our best finds. With Squamish being so close to Metro Vancouver it makes an easy day trip but there is plenty to do over a longer stay! The natural beauty of Squamish just begs to be explored and there are so many ways to see this gorgeous area by land, sea & sky. 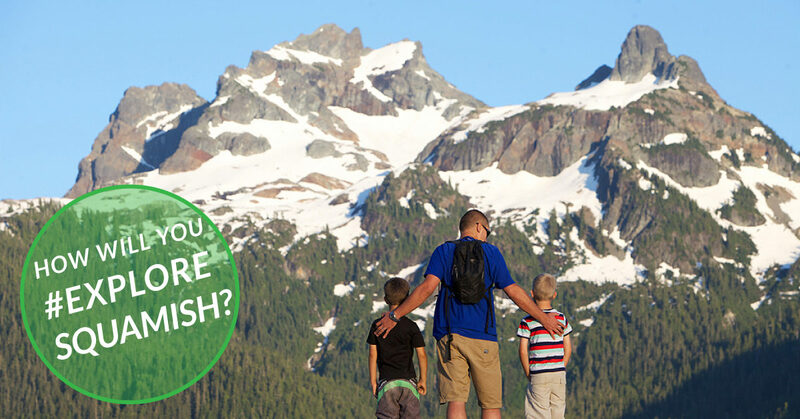 Here are just a few of the ways our family has adventured outside around Squamish. 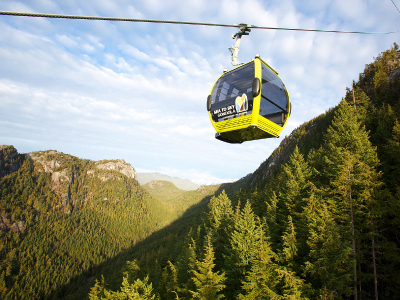 The Sea to Sky Gondola is a nature-lover’s dream spot. The gondola ride offers stunning views of Howe Sound & the Chief as well as Garibaldi Peak & Shannon Falls. At the top families can choose to explore the well maintained stroller-friendly Pacific & Spirit trails, venture a bit further afield on the Wonderland trail or hike into the back country for hours. For those wanting to earn their views, try the strenuous 4-6 hour Sea to Summit trail (we recommend good hiking clothing / foot wear and plenty of snacks). This trail was done by our 5 year old but kids should be experienced hikers to attempt this trail, and at the top enjoy a celebratory treat in the cafe! Not all river rafting is about the adrenaline surge. Sunwolf offers a winter river float that is perfectly designed for a more mellow day and is appropriate for younger children. The Squamish River winds through Brakendale and offers a great vantage point to see the magestic eagles that winter in the area. Brakendale (minutes north of Squamish) is the Bald Eagle capital of Canada seeing thousands of birds each year from December to February. West Coast Railway Heritage Park is a not-for-profit association in Squamish dedicated to preserving all things train! 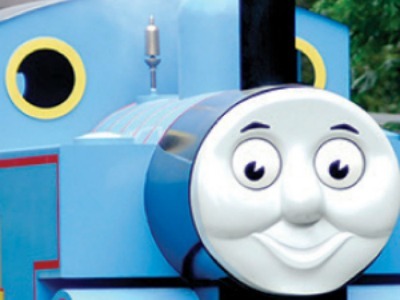 You can visit the park year round, but our favourite family outings there include the Polar Express train rides throughout December, Day Out with Thomas over two weekends in the Spring, and the mini rail train ride for kids that’s open during spring & summer! Many people are surprised by the fact the Squamish is on the ocean. Kids & parents will all enjoy the freedom and relaxed time combing the beach, splashing in the sea and playing on the drift wood. It is amazing to spend time seeing the world through a child’s eyes. What you thought was a downed tree is very obviously a pirate ship. Dragons & mermaids can be found under boulders. Bring a picnic from one of the wonderful cafes in town & enjoy quality unstructured playtime! 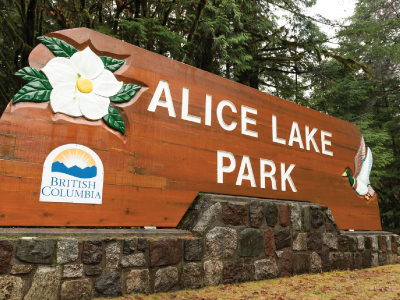 Alice Lake Provincial Park is the perfect hiking spot for families. There are trails of many lengths, a picnic area, bike skills park & playground. In the summer months the beaches fill up quickly but the off season is a great time to enjoy the natural beauty of the park. We recommend the trail around Alice Lake (approx. 1.5 km) as the most gentle trail, next would be the one around Stump Lake (approx. 2km) as a bit more adventurous but still kid friendly, then the 4 lakes loop (6 km with longer hills) for families with older kids. BC weather can sneak up on you and dash even the most carefully laid plans. Not to worry! 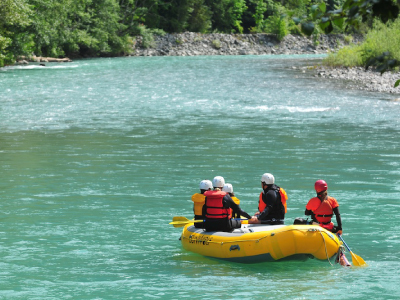 Squamish is used to the liquid sunshine and has plenty of indoor options for families. 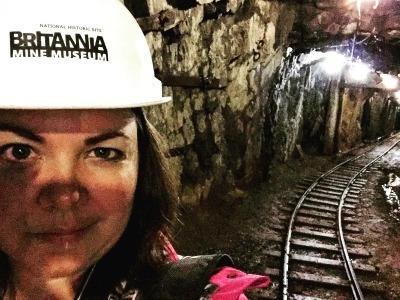 Gold pan, ride a train underground, experience the feeling of being a miner & wear a safety hat. We promise the kids won’t even notice the weather with all the fun! 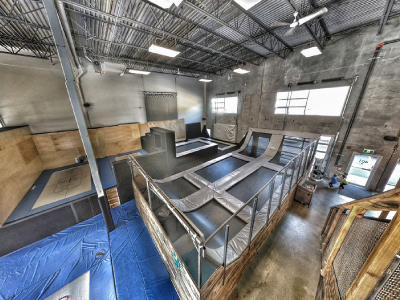 The whole family can get into the trampoline fun at Airhouse! This is the perfect place to spend an indoor afternoon especially if you have a wide age range. Caution: there is a high risk of teenagers actually smiling! If you have younger kids who need to burn off their energy then Squishies is the place to do it! 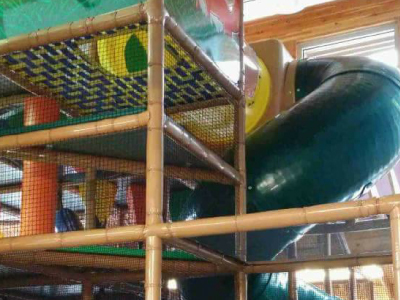 This new indoor play area has all the slides, tunnels & climbing they could ask for and a cup of coffee for the parents. 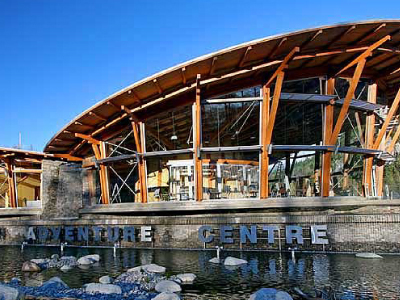 Right at the main intersection in Squamish you will find the unmistakable Adventure Centre. This is you prime stop to find out all the information on all the activities in the region, or have a quick bite to eat with an espresso. This is also where you can watch a movie and rent bikes or SUP for the day from Sea to Sky Adventure Company. Squamish has so many family-friendly places to eat that offer fantastic foods year round. And in the summer be sure to stop in at the Farmer’s Market on Saturdays for even more great treats and visiting food trucks. 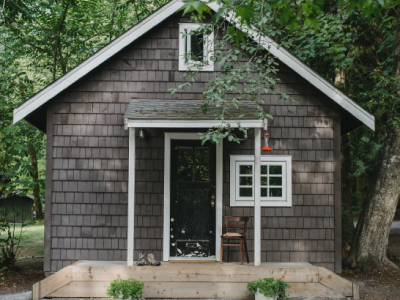 Here are a few of our favourite spots….shhh, these are real local gems. 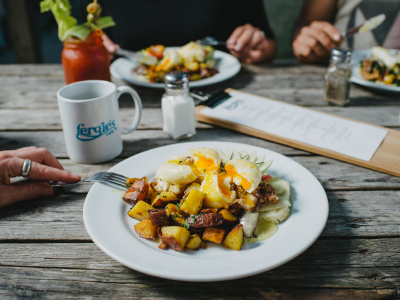 Fergie’s Cafe is the perfect spot for fabulous breakfasts & brunches. Relax on the sun-drenched deck or in the newly added indoor dining room & enjoy fabulous views of mount Alpha. Here you will find fresh, locally-sourced & lovingly prepared food. There is room outside for the kids to run off energy making for a relaxed morning for all. Our favourites are the avocado benny & salmon burger! 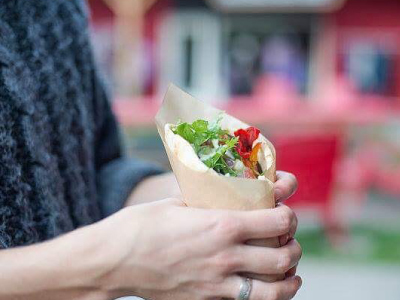 “Voted one of BC’s best mobile eateries by British Columbia Magazine”, the Locavore Food Truck is our absolute favourite for fresh & delicious meals made with organic, locally-sourced and grown ingredients. Find them at the On the Farm Country Market, where the kids can enjoy the outdoor space and play house. Our top item to order is the donair & roasted potatoes! 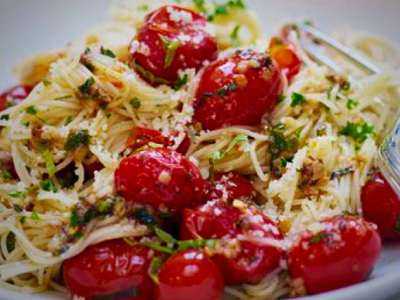 The Crab Tree Cafe was founded by previously unhealthy individuals seeking a healthier way of eating. They create spectacular dishes with the intention of bringing happiness through the appreciation of wholesome, delicious food. The menu is designed to appeal to all, with a focus on traditional cuisine, families, vegan, gluten free and organic food. Our favourites are the Garden burgers & the red Thai curry. They even do Meatless Mondays! Have it your way! This is the perfect spot to keep everyone in the family happy. 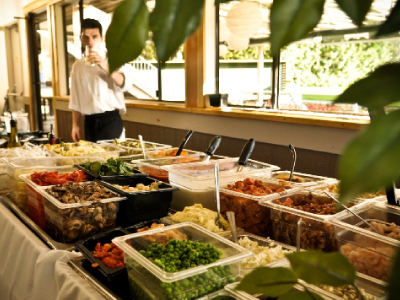 Friday nights turn the restaurant at the Squamish Golf Course into a pasta buffet where the chef creates your personalized pasta dish from the many fresh ingredient choices (including a gluten free pasta choice). The Clubhouse is set amongst panoramic mountains providing an inspirational setting and the $14.99 all you can eat price for adults can’t be beat! Kids pay according to their ages. 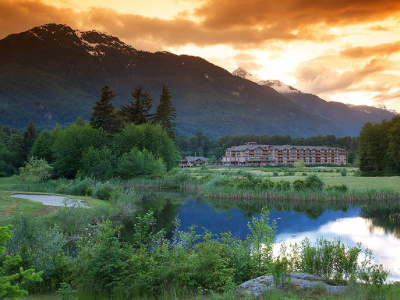 At just a 45-minute drive from Vancouver, Squamish is the perfect distance for a day trip or a relaxed overnight stay. There are many great options for camping but when it comes to a cosy end to the day we think that these two spots take the cake. All rooms here are suites and the kids will go crazy for the indoor/outdoor pool and hot tub open all year long! Spend a perfect weekend in a comfortable, mountain-influenced, condo-style getaway with the comforts of home and more. Stroll along the banks of the Cheakamus, listen to birds chattering, or gaze at spectacular views of Mount Alpha from the hot tub. With a fire pit, volleyball net, horseshoes and lots of greenspace for lawn games, you’ll find plenty to do right here on your doorstep at Sunwolf.